Major appliance retailer, looking to invest in new lighting to replace existing commonly used fluorescents at their 1.2 million sq. ft. distribution center in Dinuba, CA, opts to use energy efficient LED lighting to create a more even distribution of light and provide better clarity when reading labels on boxes. 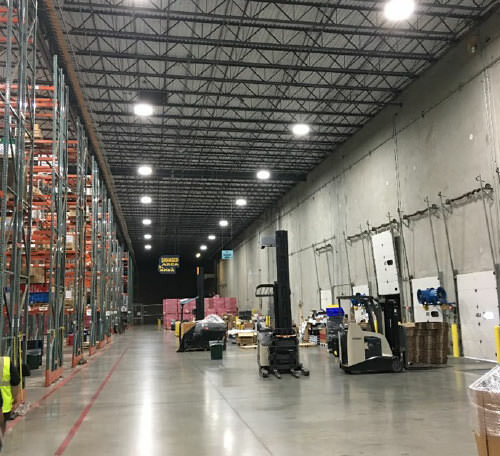 FSC Lighting’s LEHB series was chosen to replace, 4,6, & 8 lamp T5HO fluorescent high bays throughout the warehouse, reducing operating costs while enhancing the visual appeal of the vertical racking. By replacing fluorescent high bays with FSC’s LEHB, this major retailer will use 1,286,064 fewer kilowatt hours (kWh) per year, an annual savings of approximately $186,479. Sensors were installed to improve efficiency and eliminate redundancy of electricity. As an added benefit the LEHB LED fixture qualified for a utility program and was granted $240 rebate per fixture. Annual energy cost savings coupled with the substantial rebate, guarantees a simple pay-back 1.1 years. 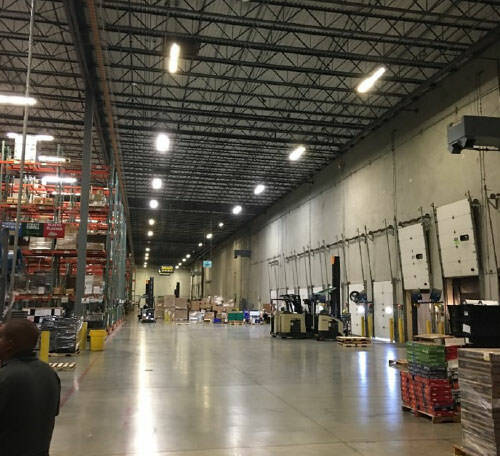 Appliance retailer saves 51% in energy consumption by retrofitting their distribution center with FSC LED High Bays.